Produced by Eduardo Tarilonte, Accordions 2 is considered the first choice if you are looking for a realistic and, above all, playable accordion library. Numerous renowned composers and producers rave about the authenticity and expressiveness of this virtual instrument. 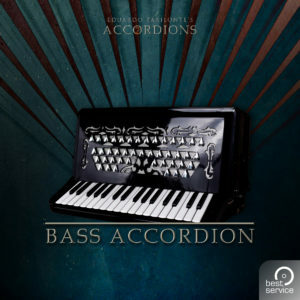 With Single Bass Accordion you get a virtual accordion from Eduardo Tarilonte’s Accordions 2 as a single instrument. The bass accordion is intended to play low registers in the accordion orchestra, so if you are looking for a realistic and playable bass accordion for your current project, this single instrument is the perfect solution. This single instrument was exclusively designed for Best Service Engine 2 and is therefore not compatible with the Kontakt Player. Best Service ENGINE 2 Sample Player is included in this product! An internet connection is required to authorize / activate the product (Challenge/Response). AudioSage connects music and audio creators with innovative emerging technologies from all over the world. Best Service of Munich Germany develops an expanding universe of professional quality multi-sampled virtual instrument, DSP and SFX libraries created by multiple international teams of highly skilled developers. In addition to Best Service VIs Best Service also distributes a curated catalog of 3rd party VIs from a growing community of brands.